Yesterday, I took Danny to the new urgent care center down the street cause he was suffering from vertigo and fatigue. Since there have been some cases of Swine flu where he works, he was a little concerned. Luckily, he does not have the flu. While I was sitting in the waiting room, I happened to pick up a magazine dedicated to life in the Carolinas and I read all about the various cities and places to move to up there. Last night I checked some real estate listings and pics of homes in Western NC and SC and while I really liked the lower than Florida prices and mountain views and puny real estate taxes, the idea of moving up there did not touch my heart strings like the idea of relocating to Pennsylvania did several weeks ago during my visit. They were just pretty places to me. Pretty as my current town of Winter Park is. I reflected on it just before I fell asleep last night and realized that I have seen many beautiful places in my life in many states and countries. I learned to love Hilton Head in the half dozen years I lived there part time and appreciated its beauty immediately. In fact, I pretty much like all beach towns. Switzerland and Austria were breathtaking. France was beautiful too. So was West Virginia. Austin, Asheville, Charleston (SC), Savannah, Minneapolis, and San Francisco are some of my favorite American cities with great appeal and quality of lifestyle. Only two places visited immediately felt like "home" though almost at first sight: places I knew that I could happily move to and where I felt strongly that I "belonged". Those two places were Western Pennsylvania and England. The first probably because I was born there and am a 12th generation Pennsylvanian, although most of my life has been in Florida. I really would fit in there from entitlement if nothing else. (Lol.) 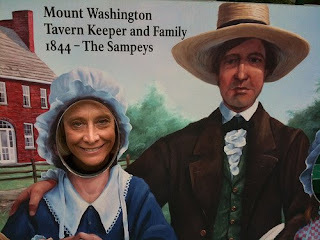 The second, no doubt, felt so homey from hearing many many stories from my mother (whose hobby was Genealogy and who traced her English kin to 850 AD) about our long history as a family in England before beginning the process of emigrating to Pennsylvania in the 1680s. Culturally, our family was British, despite the heavy Scotish and German infusion of root stock over many generations in America, and every time I visited England I felt very much at home there both with the terrain and the people. I visited Germany several times and felt no such pull. And Scotland, although I am an admirer of her culture and my own Scottish ancestry, just doesn't have enough forests for my taste. 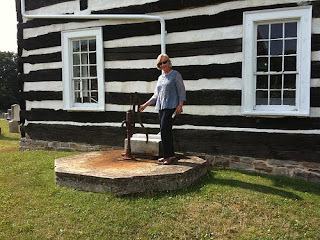 That I feel so much affinity for English history and culture and Pennsylvania's colonial history I attribute to the power of storytelling to children. It certainly also jump started my fascination with history in general. So, my conclusion is that unless I move to one of those places that tug at my heartstrings, which would be difficult for the first and implausible for the second, ( thanks to the immigration and government policies of the past several decades, England isn't as English as it used to be and I probably wouldn't feel as at home there anymore), Central Florida will do just as well as anyplace else. As long as we can maintain our present quality of life and the ocean doesn't rise and swallow us up. We do have lots of sunny weather and the beach is only an hour away from my town. Of course, I don't like the hurricanes and mosquitoes (who would?) and the consistent unfriendliness of neighbors here is disappointing, but at least I know how to deal with the weather and bugs and have been ignoring (most of) my mostly transient neighbors for fifteen years just as they ignore me with no real diminishment in the quality of life that really matters. And I do enjoy the theme parks which are close by, yet far enough away, that the tourists don't come to my little oak canopied town. Heck, most of them think junky International Drive near the parks with one chain restaurant after another is Orlando since that's all they usually see. Which is all right with me since it doesn't make it hard to get a dinner reservation in Winter Park. And of course my family is here and not likely to pull up stakes for other parts. So, with the real estate situation what it is and especially since it would be a major undertaking just to move down the street from my present location, and I am lazy...uh...a personal energy conservationist, I guess I will stay put and count my sunny day blessings. I guess I better stop looking at Pittsburgh real estate listings and hit the beach. PS: We're going to visit Virginia next summer. My parents and I used to go there pretty much every other year when I was little. I remember I really loved those trips. I may come back wanting to move there too. Who knows? The ox is slow but the earth is patient. We had supper at daughter Laura's house on Saturday where I took these pictures of little Bailey Lynne with my iPhone. She is now five months old and is developing quite a little personality as you can see for yourselves. I hadn't seen her in almost a month due to being away and all the various evil bugs the Brown family has been passing back and forth between themselves recently. Laura made home made bread, salad, and chicken enchilada chowder for dinner with brownies topped with chocolate chip cookie dough for dessert. She is a good cook. Six year old PJ was excited about starting school on Monday (today). He is a big first grader now and proud of the Transformers backpack that his Aunt Amy gave him. Seeing kids and grandkids was delightful and helped ground me in Florida soil a bit again. Although I still dream of Pennsylvania at night. I mean that literally. Danny says we might not like it so much up there come a January blizzard and he's no doubt right, but I just feel like I've been berthed here much too long. Everyplace is too familiar and I've "done it all" too many times. We should probably go to the beach next week end if the weather is sunny which will further anchor me to Florida soil, uh sand. I do love a beach. And renew Disney passes later in the fall. Recapture Uncle Walt's magic. Its been about three years since our passes ran out. The RV road trip was a great success though. As I said in previous posts, I don't like to travel by commercial airlines or in cars. I have no real affinity for hotels either. I didn't travel when I was alone (ie before Danny) cause, well, I hate being in unfamiliar places alone and hate programmed tours with people I don't know and may not want to and where I am on somebody else's idea of a schedule. Especially if it involves early morning departures. I didn't want to leave the dogs behind, either. I do like to see new things and new places though, as well as revisit those I haven't seen in a long long time. Ergo, the RV was a great idea. My hotel was with me the whole time. So were the dogs. I could sight see, sweat, park in a restaurant parking lot, shower and change, exit vehicle and go right into a spiffy dinner. Which I did one night. The dogs were right there in the air conditioned RV where I could check on them if desired. I could move around the vehicle while Danny drove. Read, sleep, be on the computer, take pictures out the windows. And there was no need to stop and exit for bathrooms or food. If we ate in a restaurant and had leftovers we could store them in the RV fridge for another meal. Handy that. Also handy was fridge for late night snacks of my choosing. Microwave, gas cooktop, and coffee maker, too. 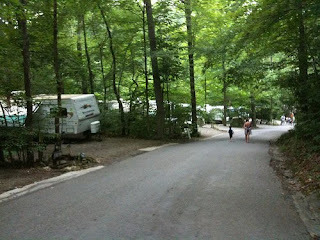 The campground facilities we stayed in were much nicer than I had expected, too. And easy to find on the spur of the moment. They weren't expensive, averaging $25.00 night for parking pad, electric, water, sewer, and cable hookup. Most had nice pools and nice wooded walking areas, some had fenced dog parks, miniature golf, cafes, etc. One had log flume rides, a fishing lake, a outdoor movie, hayrides, and a nightly dance. Another had food delivery to your RV. One had free breakfast and gym use at the next door hotel. 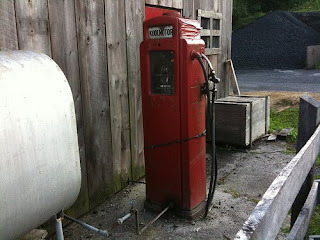 The trip was economical on fuel too, since we averaged 15 to 17 miles per gallon on diesel. All in all, a good way for me to travel. Now that I have a taste for it, I cant wait for the next trip. Danny says I will probably want to move wherever that is for awhile, too. We'll see. Maybe in the end I will just turn into a 'gypsy' with a Florida home base. It has been about ten days since I returned to Florida from my trip to Pennsylvania. I am still overflowing with longing to be up in Pennsylvania instead of back in Orlando. Now granted I went there in summer which is one of their very best seasons and returned to Florida during our very worst season, when the humidity makes you feel like you are in a mug treading warm soup every time you leave the house. When the mosquitoes are particularly bloodthirsty and numerous, spiders manage to get in the house no matter what, and its freakin' close to 100 out most afternoons before the nasty thunderstorms roll in. Our summer is equivalent to their blizzard time. One thing you can say in Florida's favor though is that no matter how hot it gets, you can leave and go someplace. Not so easy in the north where you can actually get snowed in for a few days at a time. My children and young grandchildren live here. I love the beach: which is only about an hour away no matter whether I go east or west. I enjoy the theme parks at Disney, Universal, and Sea World. I have a lot of friends here. A good life. You betcha. No complaints. But, having said that, if somebody was to knock on my door and offer to buy my house for a fairly decent price, I'd be out of here ASAP right now. Logical or illogical wouldn't matter. My roots are up north and having realized that so dramatically, I want to go home. Have a white Christmas. Enjoy the changing leaves in Fall and the tulips and daffodills in Spring. Breathe air that doesn't make me constantly sneeze. Live on a hill. Drive to the mountains instead of the beach. Not live in a tourist mecca. If you haven't been there you wouldn't know, but Western Pennsylvania is breathtakingly beautiful. Pittsburgh, where I was born, is a clean progressive city full of very friendly folks with every cultural advantage (thanks to old Robber baron fortunes) a person could want. Full of stunning parks. Three rivers. Great public transportation, free to seniors. Lots of hospitals. Higher educations centers such as Carnegie Mellon University, University of Pittsburgh, Duquesne University, Chatham College, Washington and Jefferson University, and Robert Morris College. With great athletic teams (Go Steelers!). Housing is much cheaper than here and not cookie cutter boxy boring. Job market is better. Schools are better. (In my old township, 98% of all public school students go on to four year colleges) People stay in one place a long time there. For a reason. Its a "Family" place. Before I went back, I'd forgotten just how unfriendly people are in Florida by comparison. I think maybe it is the transient mentality, or the divorce rate or something else altogether. I don't know. But, I have never been invited to a neighbors house (socially) more than two times the entire 14 years I have lived in my present neighborhood. People wave and smile but its not the place where everybody knows your name. My old neighborhood of 15 years, also here in the same town, was not much friendlier either. If you want friends you meet them through interest activities around these here parts, Pardner. Not on the street where you live. Course I live in Winter Park, which rightly enough has a uppity yuppie image and contentious folks who fight on every single community issue. Other parts of Orlando might be better. In any case, sigh, according to this morning's newspaper, Florida is losing population. It is one of the worst real estate and job market places in the whole USA. Selling my house and leaving the state is probably only pipe dream. Maybe for the best since the first big blizzard might find me begging for the Sunshine state again. Yes, I'm stuck to my seat, not just because I've sweated to it, either. I can only dream of green hills, pine trees that are full and lush, woodland critters in the yard, lightning bugs and snow for Christmas. But wait, I have an RV that my unfriendly neighbors hate...I can at least travel to the mountains of Pennsylvania again. West Virginia and North Carolina too. As much as I want and Danny's job allows. Mountains will be there waiting. That will have to do. 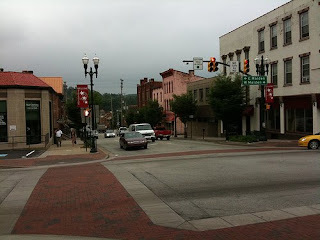 Despite the fact that I only lived in Pennsylvania for the first fourteen years of my life and have lived in Florida pretty much for the rest of it, I discovered upon entering the small town in the Laurel highlands that my mother's people came from, that my roots run deeper than I would have believed before. I felt like I was truly home at last. After too many decades. Why did I wait so long? I don't have a good answer to that. I was busy. Life happened, I guess. But, mostly, I didn't think to go before my mother died and left a note requesting her ashes to be interred back home where she was born. 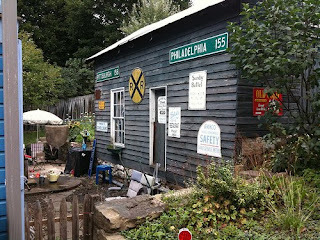 But, I did find myself strongly drawn to the Keystone State with a lift of spirits that began as we crossed the Maryland border into Central Pennsylvania heading west and the feeling intensified in Bedford County. It wasn't just the half remembered but instantly recognizable and familiar cadences of the speech of the folks living there or the houses made of field stone, soft faded pink brick, and white clapboard. It wasn't just smell and sight of the Scotch Pines or the Blue Spruce trees and the rhododendrons and mountain laurels or the way the earth went up or down but was never flat for very far. It wasn't the lightning bugs that made me smile remembering the classic American summers of long long ago. 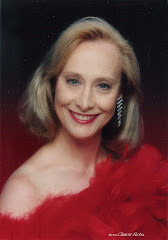 It wasn't being among folks with pale complexions and blue eyes and yellow hair just like mine. Folks who spoke of 'GW' and meant Washington not Bush. It was partly those things, yes, but it was something more. I found the answer in the old cemetery just outside of Schellsburg as I gazed at some of the graves and headstones of my great grandparents four times over. The graves and the stories of the bones within whispered the history of my very own people: Millers and Colvins, Mortimore, Sill and Galbraith: those tough as nails Scots /Irish, English and German pioneers who had the grit to leave the familiar and the mundane and the safe behind and move into uncharted territory and make it their own. The graveyard and the church built in 1806 with its faded headstones, weather scarred, some leaning a bit to the side, has a spare, stark uncompromising, startling beauty, just like I envision the people it shelters once had. I've always loved history. History is stories, some true, some maybe not true about people and what they do. History is about all our ancestors. I am just lucky to know a lot of the specific history about my own family. Complete with pictures, drawings, Bibles and journals and physical artifacts. 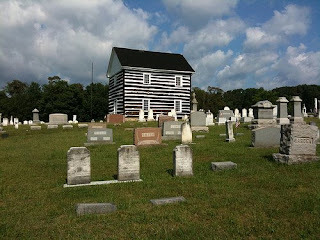 Some of Mother's people came over from Scotland and England in the 1680s to settle in the Philadelphia area and move westward with the generations, losing their identity as pacifistic Quakers, becoming gun toting Methodists and Presbyterians, fighting in the Revolution and Civil War until finally stopping at the golden triangle of Pittsburgh. My mother's parents were the last to settle in the Steel City, leaving Bedford in search of new jobs in the wake of the Great Depression. My daddy's family came over from Germany in the 1850s, the last of my folk to leave the old world for the new. 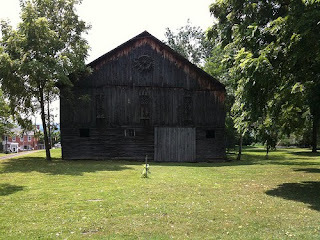 Mother's family had been joined in the Bedford area the 1700s by the German branch of the clan. 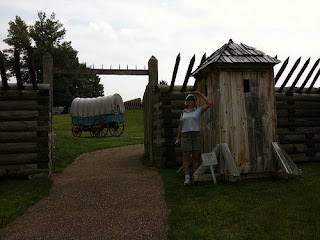 When moving westward in search of new land and new experiences, they traveled the first highway through the wilderness, no doubt in the famous Conestoga wagons carrying the Pennsylvania long rifle. The highway, carved out of mountain rock, was the one ordered by the unpopular King George III of original tea party fame to move George Washington and General Braddock and their red coated soldiers west to drive the French out of western Pennsylvania. It was was the very same route Danny and I took several hundred years later. That gives me a shiver of wonder. Too travel a road walked on by my ancestors. At Chestnut Ridge in Schellsburg, I looked at the headstone of my great great grandfather, James Hervey Miller. 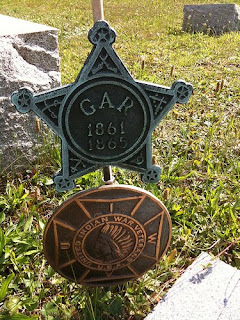 It read, LT in the GAR (Great Army of the Republic/Union Army), veteran of the Indian War. Nearby, the headstone of his son Major Dr. William Sill Miller, veteran of World War I and the trenches of France and Belgium. Down the hill and across the road, were ancestors who had been there so long that the lettering was rubbed off their stones. 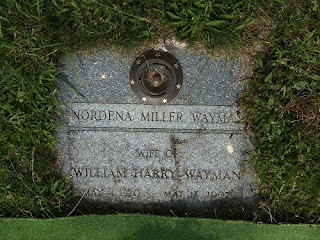 Then, I looked at the headstone of my own father, Sergeant William Harry Wayman, US Army Air Corps in WWII. And placed flowers on my mother's newly dug grave. I belonged in that place, I felt, the way I could never belong in FLorida where I am a transplanted 'daffodill', simply living from day to day. I could never put down deep roots in La Florida's sandy soil. My children would disagree, but then, they were born here. I understand now why my father, who never wanted to stay in Florida, chose to be buried in that little Pennsylvania mountain cemetery with Mother's people, even though his family was from Pittsburgh 90 miles to the west. I could breath easier in the mountains than in the heavy jungly humidity of central Florida. I could almost see the lifeline stretching from the land to my own heart. We drove further west to Pittsburgh the next day and with a little help from Google maps found my white clapboard and fieldstone childhood home. As I gazed upward at the Scotch Pines and Blue Spruce trees that formed a grove in the front yard and nearly blotted out the sky, I again thought about my father. 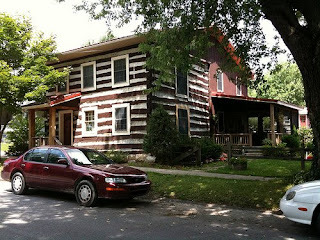 He was pretty handy: he built the house's second story himself. He crafted the fieldstone wall that ran along one side of the house next to the driveway out of foundation stones from his great uncle's farmhouse. The stones of the large chimney that decorated the house front also came from Heinrich (Harry) Geib's farm. And those tall pines were the Christmas trees of my young years. I don't know who lives in the house now, but I am grateful that they chose to keep the trees: a living legacy of my dad. Like me, those trees have deep roots in the Pennsylvania soil. Time was short and I didn't get to visit my Wayman (Weimann) and Geib kin in the Mt Lebanon cemetery my dad rejected or stop by the craftsman style home my grandmother Wilhemina lived in for seventy years. Next time I'll make it a priority. For I know now what I should have known before: the literary quote is wrong. You can go home again. I did. I will. Some more random photos from our trip: all taken on iPhone. Enjoy! picture 4: the house where i was born i n Pittsburgh. Pine tree behind me was one of our Christmas trees. 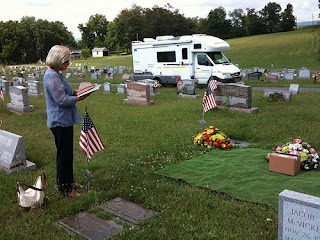 pictures 6-10 at Chestnut Ridge Union Cemetary, Schellsburg, Pa.
We're back from our first ten day road trip in the Winnebago. We went up I75 from Orlando through Florida, Georgia, South and North Carolina, Virginia, Maryland into the Laurel and Allegheny mountains of Pennsylvania, which was our destination. 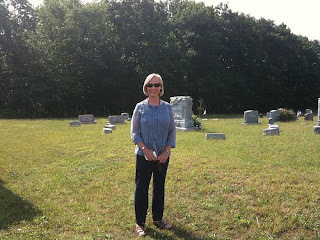 The reason for the trip, as you probably remember from earlier posts, was to keep my promise to inter my mother's ashes in the historic Schellsburg Cemetary where her people have been buried since colonial times. It was wonderful in the mountains! No biting bugs (except horse flies in Virginia), cool nights in the low 60s, very little rain, misty mornings, breathtaking scenery, friendly people. We enjoyed seeing the wildlife: eagles and hawks, owls, deer, beaver, wild turkeys, rabbits, gophers, groundhogs, chipmunks, and red squirrels. I got to see lightning bugs again in the evenings when we stopped at the various KOA and Jellystone camp resorts. The dogs loved their nightly campground walks in the woods. 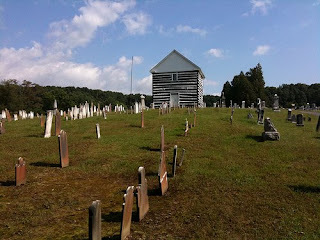 After the burial and searching the Chestnut Ridge Union Cemetary for family grave sites and viewing the old church, built in 1806, we explored the picture postcard towns of Schellsburg and Bedford. (Could be stand ins for Stars Hollow, Gilmore Girls fans)We spent the next day at Old Beford Village, a recreated colonial town of 37 authentic buildiings, and had dinner at the Jean Bonnet Tavern circa 1756 which was a stagecoach stop on the first National Highway (toll road) built by George Washington during the French and Indian War. The tavern is certifiably haunted. So was the log and fieldstone house adjacent to our campsite in the Shawnee Sleepy Hollow Campground. The owner told me he had to have the ghost exorcized when it assulted his teen age son, apparently over a choice of loudly played music. 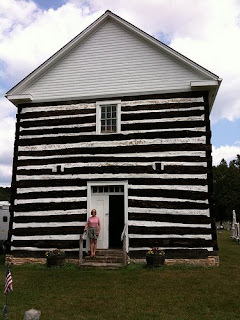 We drove the historic route to Ligonier where we spent part of the next day touring Ft Ligioner (French and Indian War again) and went on to Pittsburgh where we visited the house in Upper St Clair township that my Daddy built after WWII. We lived there from my birth until I was 11. The house in good shape and not too much changed, although the woods that once bordered it are developed. 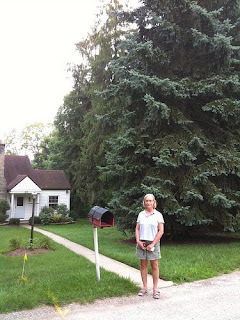 The giant Scotch pine and Blue spruce trees that form a grove in the front yard are our former small Christmas trees!! Old' red dog' driveway has been paved but we saw a ground hog skulk down it to disappear around the garage. Danny was interested in seeing the neighborhood since I've written so much about it in my Birdy Grace and Annie stories. The wall I fell over into the 'Bundy's' driveway is gone as is the shed I was once locked in by a neighbor boy. The woods of the story The Clearing are no more and the old Baldesberger and Hayes farms are gone, having become upscale housing areas. My 'arch enemy' Ricky's house is just the same. We reflected that Western Pennsylvania is indeed 'guns and Bible' land. From my point of view, as a Pennsylvanian, that is not at all a bad thing. Outside of the big progressive city (Pittsburgh) area we spotted few Barnes and Nobles or Starbucks. Instead, a whole bunch of mom and pop restaurants, lots and lots of working farms of planted corn and dairy cattle, and every town no matter how tiny had a roadhouse bar, a pizza place, and a soft serve ice cream stand. It is also beautiful countryside. Nothing is flat for the most part. We enjoyed driving along a road to suddenly spot a colonial log cabin with split rail fence or an early 18th century farmhouse. Most are still inhabited. We camped that night high in the hills above Washington Pa, south of Pittsburgh proper where we saw my Daddy's college (Washington and Jefferson) and toured the circa 1760s house that belonged to the leader of the Whiskey Rebellion ( Bradford house) and the early 1800s house belonging to Dr Lemoyne which was the first stop on the Underground Railroad. After that, we moved on through the scenic Laurel Highlands route to stay at a Jellystone Park in Mill Valley (Ohiopyle State Park area) that made me feel like I was in the film Dirty Dancing. They had an outdoor theatre, a fishing lake, a teen dancing pavillion, three pools, a log flume ride, a miniature golf course, a train ride, hayrides, and cabins for rental. The place was humongus! People were making smores and having fun and it was obvious that most were there for a week's vacation. Near the campground in Bear Run is the amazing Frank Lloyd designed house Fallingwater. After seeing Fallingwater we moved on to see FT Necessity (More French and Indian War) and the Mount Washington Tavern built by George Washington. Did you know he was one of the major whiskey distillers in Colonial America? Not just a surveyor, soldier, General, President, and plantation owner. GW was a man of many parts. 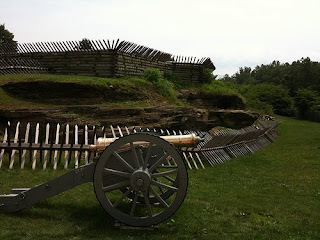 By the way ,up in Western Pa, the name 'GW' refers to George Washington, not George Bush. If you're Pennsylvania born, you pronounce it George Wershington. After Pennsylvania, we took the mountain route home through West Virginia, which wins my personal award for most beautiful mountains I've ever seen. Loved shopping for West Virginia craft items too. Danny got vertigo driving the hairpin turns three thousand feet up. We counted 50 deer in one ten minute period. It was memorable and I'd go back there in a minute. But not in n January! I took about seven hundred pictures and have posted a very few here. I will post more in coming days. I am tired and glad to be home but miss the hills, mountains and cool cool air. Florida is too damn hot.